To find a nearby exoplanet similar to Earth is the hope and the challenge. Even for Gliese 832c – a possible super-Earth only 16 light years away – discovering how comparable it is to our home planet is super-tricky. At present, habitability is measured in terms of similarity to Earth, so some rate an exoplanet's potential via the Earth Similarity Index (ESI). However, for astronomers like Robert Wittenmyer, part of the team that discovered Gliese 832c, reducing a planet's habitability to a few integers is a big mistake. "It is absurd to try to compress such a multi-dimensional problem into a single number," said Wittenmyer, "especially as we have zero idea about other important factors such as rotation, cloud cover, tectonic activity, and so on." For an exoplanet to earn a high score on the ESI – also known as the "easy scale" – it must have only four properties analogous to our own planet. These include a comparable mean radius and bulk density, a similar escape velocity and an equivalent range of surface temperatures. Based on these factors alone, of all the currently known exoplanets in the Universe, the closest one with the highest ESI is Gliese 832c. 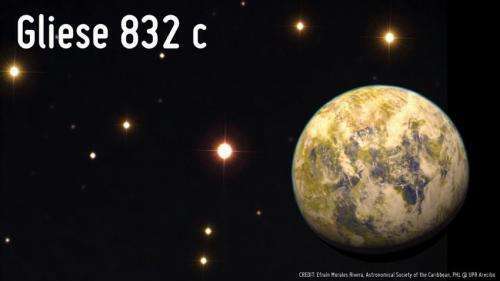 Gliese 832c is the second planet discovered around Gliese 832, an M dwarf star in Earth's greater neighborhood. The first was 832b, detected in 2009. 832b is a Jupiter-sized exoplanet that orbits Gliese 832 every 9.4 years. Just last month, Wittenmyer and colleagues at the University of New South Wales reported the discovery of 832c: a likely-rocky planet well within the habitable zone around Gliese 832. With a minimal mass of 5.4 +/- 1.0 Earths, 832c orbits its parent star in a little more than 35 days. Gliese 832's two planets are fascinating - both individually and as part of a single system. An artistic representation of the potentially habitable Super-Earth Gliese 832 c. In the background is an actual photo of its parent star (center). Credit: Taken on June 25, 2014 from Aguadilla, Puerto Rico by Efraín Morales Rivera, Astronomical Society of the Caribbean, PHL @ UPR Arecibo. For hundreds of years, scientists surmised that other solar systems ought to resemble our own: with gas giants living beyond the ice line and rocky planets circulating inside of it in orbits as neatly circular as Jupiter's and Earth's. However, thousands of known exoplanet systems defy this hypothetical convention. So far, most don't have Jupiter analogs in highly circular orbits. At the same time, many exoplanet systems do host a super-Earth, the likes of which were not necessarily predicted by models or masters of theory. Gliese 832 has it all: a Jupiter-like planet in a Jupiter-like orbit and a super-Earth with – for whatever it's worth – a high ESI. The Earth Similarity Index is a scale that runs from 0 to 1. A score of 0 on the scale means that the exoplanet isn't Earth-like at all. A score of 1.0 indicates that the exoplanet is identical to Earth, in terms of those four basic physical features. Plugging what we have estimated about Gliese 832c into the Earth Similarity Index equation generates a score of 0.81. 23 objects of interest, including Gliese 832 c, are currently in the Habitable Exoplanets Catalog. 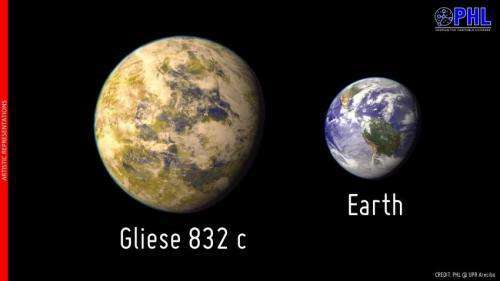 Of the top three most Earth-like worlds in the catalog, Gliese 832c is the closest to Earth. Credit: PHL @ UPR Arecibo. 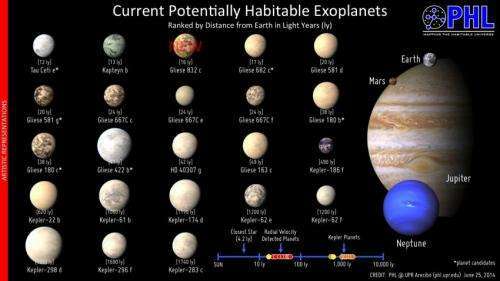 Only two other known planets have higher easy scores than Gliese 832c. These are Gliese 667Cc (ESI = 0.84) – 22 light-years away – and Kepler-62 e (ESI = 0.83), which is 1,200 light-years from Earth. At 16 light-years from Earth, Gliese 832c it the closest exoplanet with the highest easy score by quite a bit. Still, its discoverers say, it might not be the most pleasant place to visit. While this exoplanet receives a similar amount of radiation Earth – red dwarf stars like Gliese 832 are dimmer than our Sun, but 832c is closer to its star than we are to ours– its additional mass may have resulted in a bulkier atmosphere. Practically speaking, a bulkier or thicker atmosphere may very well mean that Gliese 832c is a hotter planet. Some models have show that super-Earths like Gliese 832c form denser atmospheres that lead to them be too hot for life - more like super-Venuses than super-Earths. Discovering to what degree greenhouse forces hold sway on Gliese 832c will require further study. "The issue of habitability depends on the atmosphere," said Wittenmyer, "and the only way we can know that is if the planet transits. IF Gliese 832c is found to transit, then we can get [an accurate] radius, and then an idea of the bulk density and likely composition. That will tell us whether we have a super-Earth, a super-Venus, or a mini-Uranus." 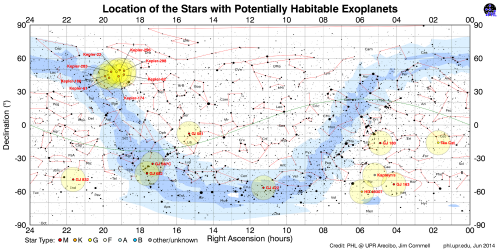 A stellar map: the position of all the stars with potentially habitable exoplanets, now Gliese 832 (lower left). Credit: PHL @ UPR Arecibo, Jim Cornmell. Pinpointing the planet itself involved amalgamating 15 years worth of data from three telescopes – the twin Magellan telescopes in Chile and the UCLES in Australia. Thanks to these observations, we now know of a sort of Solar System analog only 16 light years away. Irrespective of 832c's ESI, Gliese 832c has at least a likely rocky inner planet and a giant outer planet present and accounted for. That makes this nearby system is a good spot to search for other familiar sites. As more and more exoplanets are discovered the rules of planetary formation and habitability are being continually rewritten. An ESI score is just the beginning. In the end, with more time and much more information, we may discover that it takes an entire Solar System to produce a habitable planet. Could exoplanet be a haven for life?